I always try to get as organized as possible before the holidays. I try to prepare a few dishes ahead of time, and I always am sure to stock my pantry with several of the key ingredients I often use. During this season, I like to have on hand – evaporated milk, canned pumpkin, flour, sugar, pie crust, and the spices of the season such as cloves whole or ground, ginger and cinnamon. 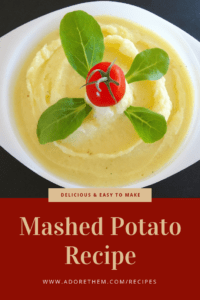 One of our family’s favorite side dishes is mashed potatoes! Most recipes call for butter. But in my house, we make our mashed potatoes with Extra Virgin Olive Oil, and we love it! !